Les Munro and the 617 Squadron crew with whom he flew on the Dams Raid. 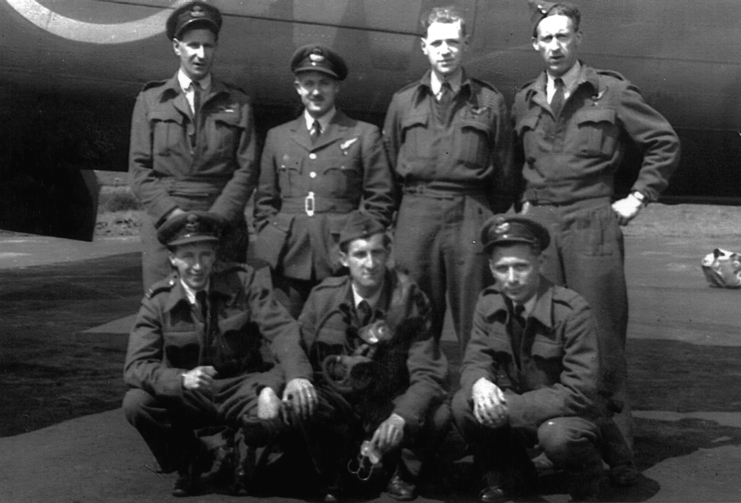 Back row, L-R: Les Munro (pilot), Jimmy Clay (bomb aimer), Bill Howarth (front gunner), Harvey Weeks (rear gunner). Front, L-R: Grant Rumbles (navigator), Frank Appleby (flight engineer), Percy Pigeon (wireless operator). 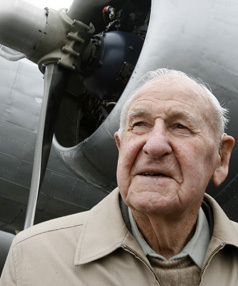 Sad news arrived this morning of the death in hospital in New Zealand of Les Munro, the last pilot to take part in the Dams Raid. John Leslie Munro was born in Gisborne on the North Island of New Zealand on 5 April 1919, the oldest of three children. His family had a sheep station a few miles outside town. It emerged in about 1999 that his mother had another child, a daughter born in 1913, in an earlier relationship but had given her up for adoption. Munro was educated in local schools, but left at 14 to work in farming. When the war came he waited until 1940, when he was 21, to volunteer for the RNZAF. He wanted to be a pilot. but he was told that his educational qualifications were ‘insufficient for pilot training’ and that he would have to be a gunner. Not to be put off, he spent the next 12 months studying at home, doing a maths course before reapplying. This time he was successful and he was enlisted into the RNZAF in July 1941. After initial training in New Zealand Munro was sent to Canada to complete bomber training and qualified as a pilot in February 1942, receiving a commission at the same time. After arriving in England, and the usual delays that followed, he was sent for further training. The core of the crew who would fly with Munro throughout most of his career began to be assembled at their Operational Training Unit, when navigator Jock Rumbles and wireless operator Percy Pigeon first teamed up with him. While still at the OTU, in September 1942, they undertook two operations. The second of these, when they were scheduled to attack Bremen, nearly ended in disaster, when their Wellington’s engines lost power shortly after take off and they crashlanded in a nearby field. Munro moved onto heavy bomber training at the end of September 1942, along with Rumbles and Pigeon, and they were joined by flight engineer Frank Appleby and gunner Bill Howarth. All five joined 97 Squadron at Woodhall Spa in December 1942, to begin operational flying. Their first operation on 8 January 1943 was minelaying, followed on 13 January by an attack on Essen. Some 17 further operations would follow in the next ten weeks, but in that time the crew flew with no fewer than eight different bomb aimers. Then, towards the end of March a new opportunity presented itself when a letter from 5 Group went up on the squadron noticeboard. Munro called his crew together and told them there had been a call for volunteers to form a new squadron. Most of the crew decided that they would go to the new squadron, but they were still without a regular bomb aimer, and the rear gunner chose not to accompany them. So they were joined by bomb aimer Jimmy Clay and rear gunner Harvey Weeks, who had both almost completed their operational tours with another crew. Two other 97 Squadron crews, captained by David Maltby and Joe McCarthy, had also been selected for the new squadron. Guy Gibson had telephoned McCarthy, whom he had met while McCarthy was training, and asked him to join the new squadron, but it seems that he did not previously know either Maltby and Munro. Munro is fairly sure that they were all transported from Woodhall Spa to Scampton on a crew bus, probably on Thursday 25 March 1943, and that there was a large gathering in the Officers Mess that evening. With hardly any time to settle in, the crews were put to intensive low level flying training, flying on borrowed Lancasters while the special ones for the Dams Raid were being assembled. Munro’s training went smoothly enough, although he and his crew had a near miss when flying low over the North Sea they suddenly saw a naval convoy ahead and had to climb steeply to avoid it. As the detailed plans for the raid were being put together, both Les Munro and Joe McCarthy were originally placed in the first wave, the nine crews tasked with attacking the Mohne and Eder Dams. However, about five days before the actual operation, Gibson and the other planners decided to beef up the second wave, who would attack the Sorpe Dam, and placed Munro and McCarthy there instead. This wave, with further to travel, were in fact scheduled to leave Scampton before the first wave and so Munro’s AJ-W was the second aircraft to take off on Operation Chastise, at 2129 on 16 May 1943. All went well for the first 85 minutes, and on reaching the Dutch coast near Vlieland the mine was fused. But then the aircraft was hit by flak. Munro and front gunner Bill Howarth say that this was fired from a land battery, but bomb aimer Jimmy Clay recorded that it was a flak ship which spotted them. Whichever it was, it did severe damage. The intercom was put out of action, the master unit for the compass was destroyed and the tail turret pipes damaged. Munro kept on flying for a while but sent flight engineer Frank Appleby down to the nose to check with Clay. He passed him a note: “Intercom U/S – should we go on?” Clay remembered his reply: ‘I wrote: “We’ll be a menace to the rest.” Had it been a high-level operation there would have been time to make up some sort of signals between Bomb Aimer, Flight Engineer and Pilot which may have worked. But on a quick-moving low-level operation like this and with other aircaft in close proximity Les could neither give nor receive flying instructions from the navigator nor bombing instructions from the bomb aimer’ and the rear gunner, Harvey Weeks, was completely isolated. Wireless operator Percy Pigeon was sent to check up on Weeks, but in doing so saw the gaping hole in the fuselage, with a host of broken wiring. He told Munro it would be impossible to fix this while airborne. So, reluctantly, Munro altered course and turned for home. When he got to Scampton he was unable to radio the control tower to tell them that he would be landing, so he went straight in. Unknown to him, another early return, Geoff Rice, was circling a severely damaged AJ-H above the runway getting his crew into crash positions. An embarrassing and dangerous incident was narrowly avoided. “Well, what happened, Les?” he asked him. Munro told him he had been hit by flak. “Oh, you were too high,” Gibson replied. Munro was about to protest and give his side of the story, but Gibson had already turned and walked away. It rankled with Munro, who felt that he had not been given a fair hearing. Nor did he feel that he could raise the matter again; it was the last time either of them ever mentioned it. Although his role in the Dams Raid had come to a premature end, Munro still participated in the events that followed. He was presented to both the King and Queen during the royal visit on 27 May. Gp Capt Leonard Slee, the officer who was accompanying the Queen, didn’t seem to know his name, so Munro stepped in, not aware he was breaking some sort of protocol. ‘My name’s Munro,’ he told her. A few weeks later he was at the famous Hungaria Restaurant party in London given by Avro. Although he wasn’t decorated for the Dams Raid he had in fact just been awarded the DFC for his earlier operations in 97 Squadron. 617 Squadron went back on operations in July 1943, and Munro’s was one of the crews which took part in a raid on Italian power stations from where they flew on to Blida in North Africa. They flew a little too low and a flak hit resulted in a burst tyre and a flesh wound to bomb aimer Jimmy Clay’s nose. These summer operations were probably not too dangerous, but the next one certainly was. This was the catastrophic raid on the Dortmund Ems Canal, which resulted in the loss of six crews out of the nine who participated on the two nights. Munro was not selected for this operation, which was extremely fortunate. However, he was back on duty straight afterwards in another abortive attack, this time on the Antheor Viaduct. Another short gap followed, but then between November 1943 and July 1944 he undertook almost 30 more operations. He became Flight Commander of the Squadron’s B Flight and was temporarily CO of the whole squadron for some of February 1944 while Leonard Cheshire was on leave. In April 1944 he was awarded the DSO. A month after D-Day, Munro was taken off operations, along with Cheshire, David Shannon and Joe McCarthy. AVM Ralph Cochrane, the CO of 5 Group, decided that all four were on ‘borrowed time’ and should cease immediately. Munro spent the rest of the war in a training flight, and was finally demobilised in February 1946. He returned to New Zealand, and the business of running a sheep farm. He was active in politics for a while and became Mayor of Waitomo District, where there is now a street named after him. In 2013 he flew to the UK for the last time, and took a full part in the 70th anniversary commemoration of the Dams Raid. He was accompanied by one of his sons and an official from the New Zealand High Commission. When I jokingly asked this official whether he was there as Les’s ‘minder’ he was quick to say that Les didn’t need any minding whatsoever. He was always forthright in his views and firm in his convictions. Back home, Munro continued with many interviews and media appearances. Earlier this year, he made the very generous offer to sell his medals and memorabilia (which include a signed menu from the post raid dinner at the Hungaria Restaurant) to raise funds for the Bomber Command Memorial in London. He felt strongly that the sacrifice of the 55,000 aircrew who died in the war should continue to be honoured. However, the collection was saved for the Museum of Transport and Technology in Auckland by being purchased by the British peer and collector Lord Ashcroft, and will stay in New Zealand. The collection will serve as a permanent reminder of the proud role played by the country’s aircrew in Bomber Command, and a tribute to this fine man. The generous offer by Les Munro to sell his medals and memorabilia to raise funds for the Bomber Command Memorial in London has now been matched by another from the British peer and collector Lord Ashcroft, which means that the collection will stay in New Zealand. Lord Ashcroft has offered to pay £75,000 for the collection and the Museum of Transport and Technology in Auckland is donating a further NZ$20,000. The collection will be displayed in the Museum. This seems to be the best result possible. The medals and memorabilia (which include a signed menu from the post raid dinner at the Hungaria Restaurant) will now stay in New Zealand as a permanent reminder of the proud role played by the country’s aircrew in Bomber Command. And the fund to maintain the memorial gets a substantial financial boost. Les Munro (and his family) should be congratulated for their generosity in making the collection available for posterity. Incidentally, the listing for the sale contains a very long article about Les, which can be downloaded as a PDF and is well worth reading. Lord Ashcroft is well known for his philanthropy and his interest in military history. He is a trustee of the Imperial War Museum in London, which houses his collection of Victoria and George Crosses. Most of the crew decided that they would go to the new squadron, but they were still without a regular bomb aimer, and the rear gunner chose not to accompany them. So they were joined by bomb aimer Jimmy Clay and rear gunner Harvey Weeks, who had both almost completed their operational tours with another 97 Squadron crew piloted by the Canadian, Marcel Cuelenaere. Even though his role in the Dams Raid had come to a premature end, Munro still participated in the events that followed. He was presented to both the King and Queen during the royal visit on 27 May. Gp Capt Leonard Slee, the officer who was accompanying the Queen, didn’t seem to know his name, so the forthright Munro stepped in, not aware he was breaking some sort of protocol. “My name’s Munro,” he told her. Then, a few weeks later he was at the famous Hungaria Restaurant party in London given by Avro, and still has a menu card signed by by most of the other diners. Earlier in the month, he had already been decorated with a DFC, awarded for his 21 operations in 97 Squadron. Several years ago Les Munro told me that he was planning to ‘cut back’ on his involvement with Dambusters projects as he had other work to do. Despite this promise, in 2013 he took a full part in the 70th anniversary commemoration of the Dams Raid, and has consented to many interviews and media appearances since. He is an inspiration to many, and long may that continue. Wings Over New Zealand: two audio interviews from 2010, each about 60 minutes. Interview 1/Interview 2. 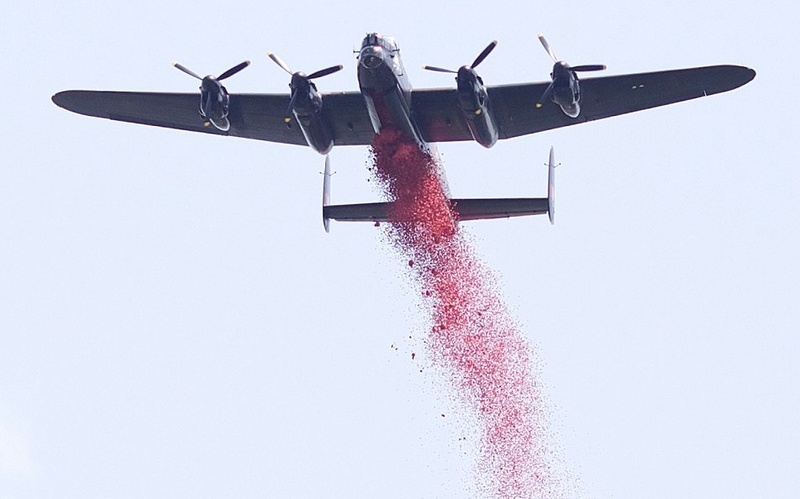 There’s an interview in today’s Telegraph with both George (Johnny) Johnson and Les Munro about the unveiling of the new Bomber Command memorial today. 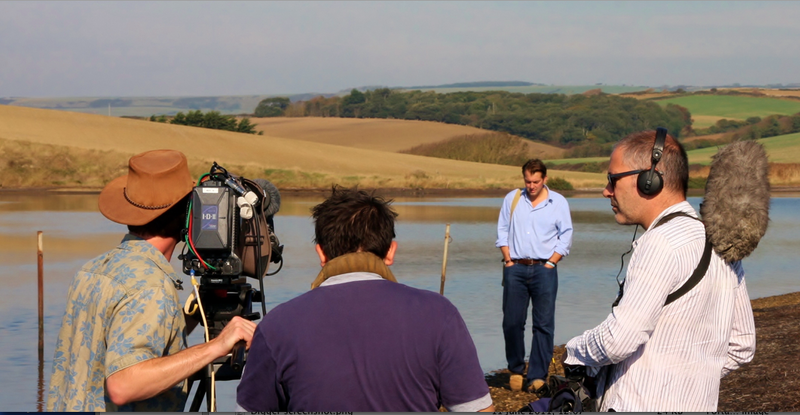 Coverage on BBC2 at 5pm (and again at 11.20pm, which I suspect will be a repeat). I will add further links to this story later today, as they come up. BBC2 is to screen yet another documentary about the Dams Raid next Tuesday, 8 November at 9pm. Subtitled “The Race to Smash the German Dams”, this promises to be a less superficial film than last autumn’s effort, which was fronted by an actor rather than a historian. The writer and presenter James Holland would appear to have done a lot of research, even flying to New Zealand to interview Les Munro, and has only just finished the final editing, according to this entry on his blog. The two main thrusts of the film would seem to be the speed at which the operation was put together – something which is covered well in John Sweetman’s seminal book on the raid – and the fact that not all the crews were as experienced as some accounts would suggest. The myth that Gibson “hand picked” the crew is something that has crept into the story from his book, Enemy Coast Ahead, but as this section of the book is based on an article in the Sunday Express which was ghost written for him, it is not a reliable account. In fact, many of the pilots were pretty experienced, having done a full tour or the best part of one. But their crews may not have been. David Maltby, for example, had just come back to 97 Squadron to start a second tour, and had been allocated a new crew, not long out of training. They then moved as a unit to 617 Squadron, and for some, including navigator Vivian Nicholson, the Dams Raid was their first operation. James Holland has also posted a transcript of his interview with Les Munro on his website. It is a very rough transcription, full of mishearings and typing errors, but interesting if you want to hear Les’s words first hand. 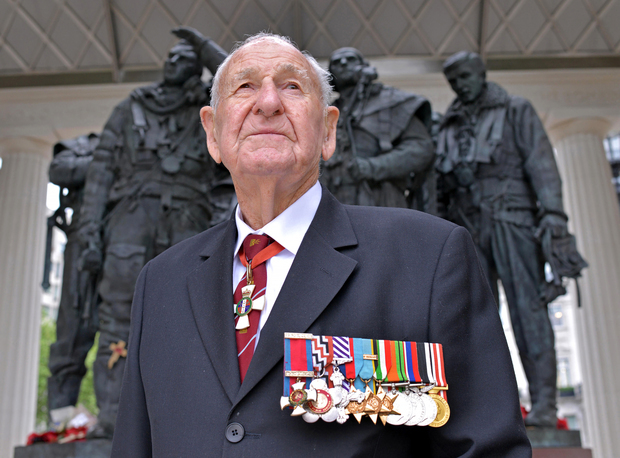 Les Munro, the only Dambuster pilot still alive, shows no sign of slowing down now that he has reached his 90s. According to the Christchurch Press, last week he sat at the controls of a Dakota DC3 shortly after a 30 minute flight over Christchurch with a group of other 2nd World War veterans. The vintage aircraft obviously brought back memories, as he commended the flight because he ‘could listen to the motors’ and get a sense of flying in a machine. Les has always been an active sort. He went back to farming after the war, as well as being active in local politics. It’s good to see that he still has plenty of get up and go. Could the next gig for the nonagenerian be a cameo in the remake of THAT FILM, still ‘in development’ elsewhere in The Land of the Great White Cloud? The only surviving Dams Raid pilot Les Munro has reportedly come out of retirement to visit the studio in Wellington NZ where the Dambusters remake will be made and is chuffed that it is being produced by a New Zealander. Long piece about Les, with some interesting background on his distinguished RAF career. And a laughing no comment when asked whether Tom Cruise might be the right person to play Gibson. Quite right too!